Subject to the matters set out below the Charity and its procedures and property shall be administered and managed in accordance with this constitution by the members of the Executive Committee, constitute by clause F(1) of this constitution (“the Executive Committee”). (ii) to assist and support charitable institutions or purposes as the Executive Committee shall from time to time determine. 1. Membership of the Charity shall be open to any person aged 18 or over who can sing a T,T,B,B part and is interested in furthering the objectives and who has paid the annual subscription proposed by the Executive Committee and approved by the membership. 2. Every member shall have one vote. 3. The Executive Committee may by unanimous vote and for good reason terminate the membership of any individual: The individual concerned shall have the right to be heard by the Executive Committee, accompanied by a friend, before a final decision is made. At the annual general meeting of the Charity the members shall elect from amongst themselves a Chairman, a Vice Chairman, a Secretary, a Treasurer and one representative for each of the choir’s four voice sections. They shall hold office from the conclusion of that meeting. 1. The Executive Committee shall consist of the 8 Honorary Officers specified in the preceding clause E and they may in addition appoint not more than two co-opted members. 2. Any appointment of a co-opted member shall be made at a special meeting of the Executive Committee and shall take effect from the end of that meeting. 3. The proceedings of the Executive Committee shall not be invalidated by any vacancy among their number or by any failure to appoint or any defect in the appointment or qualification of a member. 4. No person shall be entitled to act as a member of the Executive Committee whether on a first or on any subsequent entry into office until after signing in the minute book of the Executive Committee a declaration of acceptance and of willingness to serve as a trustee of the Charity. 5. All members of the Executive Committee shall retire from office at the end of the annual general meeting next after the date on which they came into office but they may be re-elected or re-appointed. 8. to do all such other lawful things as are necessary for the achievement of the objectivives. 4. notifies to the Executive Committee a wish to resign (but only if at least three members of the Executive Committee will remain in office when the notice of resignation is to take effect). 1. Subject to the provisions of sub-clause 2 of this clause no member of the Executive Committee shall acquire any interest in property belonging to the Charity (otherwise than as a trustee for the Charity) or receive remuneration or be interested (otherwise than as a member of the Executive Committee) in any contract entered into by Executive Committee. 2. Any member of the Executive Committee for the time being who is a solicitor, accountant or other person engaged in a profession may charge and be paid all the usual professional charges for business done by him or his firm when instructed by the other members of the Executive Committee to act in a professional capacity on behalf of the Charity; Provided that at no time shall a majority of the members of the Executive Committee benefit under this provision and that a member of the Executive Committee shall withdraw from any meeting at which his own instruction or remuneration, or that of his firm, is under discussion. 1. The Executive Committee shall hold at least two ordinary meetings each year. A special meeting may be called at any time by the Chairman or by any two members of the Executive Committee upon not less than 4 days’ notice being given to the other members of the Executive Committee of the matters to be discussed but if the matters include an appointment of a co-opted member then not less than 21 days’ notice must be given. 2. The Chairman shall act as chairman at meetings of the Executive Committee. If the Chairman is absent from any meeting, then the Vice Chairman shall chair the meeting, if that person is also not present the members of the Executive Committee present shall choose one of their number to be chairman of the meeting before any other business is discussed. 3. A quorum is when at least four numbers of members of the Executive Committee are at the meeting. 4. Any proposal shall be determined by a majority of votes of the members of the Executive Committee, in the case of equality of votes the chairman of the meeting shall have a second or casting vote. 5. The Executive Committee shall keep minutes, in books/files kept for the purpose, of the proceedings at meetings of the Executive Committee and any sub-committee. Such minutes shall be made available to members. 6. The Executive Committee may from time to time make and alter rules for the conduct of their business, the summoning and conduct of their meetings and the custody of documents. No rule may be made which is inconsistent with this constitution. 7. The Executive Committee may appoint one or more sub-committees consisting of three or more members of the Executive Committee for the purpose of making any inquiry or supervising or performing any function or duty which in the opinion of the Executive Committee would be more conveniently undertaken or carried out by a sub-committee, provided that all acts and proceedings of any such sub-committees shall be fully minuted and promptly reported to the Executive Committee. 1. The funds of the Charity, including all donations, contributions and bequests, shall be paid into an account operated by the Executive Committee in the name of the Charity at such bank as the Executive Committee shall from time to time decide. All cheques drawn on the account must be signed by at least two members of the Executive Committee. 2. Payments made by BACS or similar electronic payment system must be authorised by at least two executive committee members. 3. The funds belonging to the Charity shall be applied only in furthering the objectives. b) all investments held by or on behalf of the Charity. to be vested either in a corporation entitled to act as custodian trustee or in not less than three individuals appointed by them as holding trustees. Holding trustees may be removed by the Executive Committee at their pleasure and shall act in accordance with the lawful directions of the Executive Committee. Provided they act only in accordance with the lawful directions of the Executive Committee; the holding trustees shall not be liable for the acts and defaults of its members. 2. If a corporation entitled to act as custodian trustee has not been appointed to hold the property of the charity, the Executive Committee may permit any investments held by or in trust for the charity to be held in the name of a clearing bank, trust corporation or any stock broking company which is a member of the International Stock Exchange (or any subsidiary of any such stock broking company) as nominee for the Executive Committee, and may pay such a nominee reasonable and proper remuneration for acting as such. 4. the transmission of the statement of account of the Charity to the Commissioners. The Executive Committee shall comply with their obligations under the Charities Act 2011 (or any statutory re-enactment or medication of that Act) with regard to the preparation of an annual report and its transmission to the Commissioners. 1. There shall be an Annual General Meeting of the Charity which shall be held in the month of October or as soon as practicable thereafter. 2. Every Annual General Meeting shall be called by the Executive Committee. The Secretary shall give at least 21 days’ notice of the Annual General Meeting to all the members of the charity. Only the members of the charity shall be entitled to attend and vote at the meeting. 3. The Chairman or in his absence Vice Chairman shall chair the meeting, but if they are not present the members present shall appoint an Acting Chairman before any other business is transacted. 4. The Executive Committee shall present to each annual general meeting the report and accounts of the charity for the preceding year. 5. Nominations for election to the Executive Committee must be made by members of the Charity in writing or by email and must be in the hands of the Secretary of the Executive Committee at least 14 days before the annual general meeting. Should nominations exceed vacancies, election shall be by ballot at the meeting. The Executive Committee may call a special general meeting of the Charity at any time. If at least ten members request such a meeting in writing stating the business to be considered, the secretary shall call such a meeting. At least 21 days’ notice must be given. The notice must state the business to be discussed. 1. The meeting shall be chaired as at O3 above. 2. The Secretary or other person specially appointed by the Executive Committee shall keep a full record of proceedings at every general meeting of the Charity. 3. There shall be a quorum when at least 10 members of the Charity are present at any general meeting. Any notice required to be served on any member of the Charity shall be in writing and shall be served by the Secretary or the Executive Committee on any member either personally electronically or by sending it through the post in a letter addressed to such member at his last known address in the United Kingdom, and any letter so sent shall be deemed to have been received within 10 days of posting. 1. Subject to the following provisions of this clause the Constitution may be altered by a resolution passed by not less than two thirds of the members present and voting at a General Meeting. The notice of the General Meeting must include notice of the resolution, setting out the terms of the alteration proposed. 2. No amendment may be made to clause A (The name of the Charity clause), clause C (the objectives clause), clause I (Executive Committee members not to be personally interested clause), clause T (the dissolution clause) or this clause without the prior consent in writing of the Commissioners. 3. No amendment may be made which would have the effect of making the Charity cease to be a Charity at law. 4. The Executive Committee should promptly send to the Commissioners a copy of any amendment made under this clause. If the Executive Committee decides that it is necessary or advisable to dissolve the Charity it shall call a meeting of all members of the Charity, with not less than 21 days’ notice stating the terms of the resolution to be proposed. If the proposal is confirmed by a two-thirds majority of those present and voting, then the Executive Committee shall have power to realise any assets held by or on behalf of the Charity. Any assets remaining after the satisfaction of any property debts and liabilities shall be at the discretion of the members be given or transferred to charitable or institutions having objectives similar to those of this charity or failing that be given to some other charitable purpose. A copy of the statement of accounts, or account and statement, for the final accounting period of the Charity must be sent to the Commissioners if required. This constitution was formally presented to the membership and subsequently adopted by a majority vote as above. Our final performances in 2017 comprised our dual Charity Christmas Concerts held in the afternoon and evening of December 16. At each we welcomed the NEWSTEAD BRASS, a very well known Nottinghamshire band, under its Director John Davis. For the Matinee we were very pleased to again welcome, for the 15th successive year, the Radcliffe on Trent Junior School Choir. The Matinee was delightfully compered by Clare Allsopp, now Head Teacher but formerly, in 2003, the first Music Leader. Each year we choose a Charity to support with proceeds from these Concerts. These may be National or local. This year the Chosen recipient of the proceeds is the Friary Drop-in Centre in West Bridgeford. Since taking up the baton in September 2017 our Choir’s new MD, Michael Bonshor, had previously conducted us in two Concerts and, on 15th November 2017, at a Service celebrating the life of Richard Cumberland, one of our long standing members. Richard’s recent death was a great loss to us as well as to his family and friends to whom we express our condolences. The Choir sang at at Keyworth in October at a concert in support of RNLI which raised over £1,700 for that worthy charity. 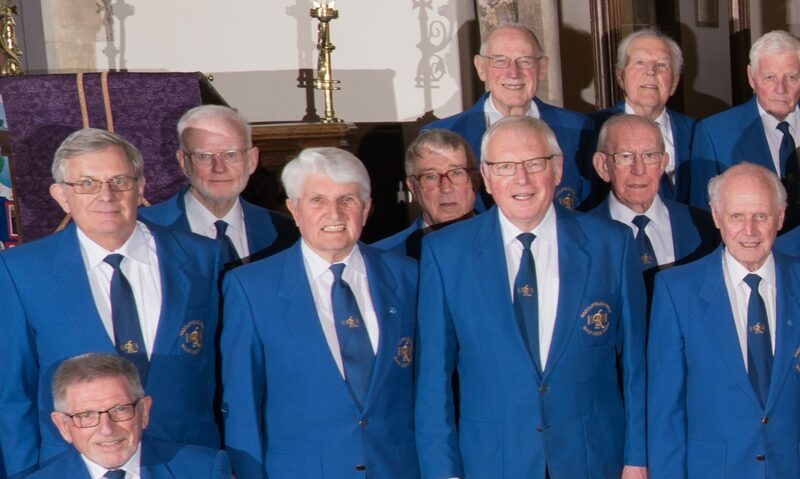 On November 18th, together with our guests from the Land of Song, the Beaufort Male Choir, we performed at a well attended concert in Grantham as a result of which the Christchurch community Project benefited by over £2,500.00.